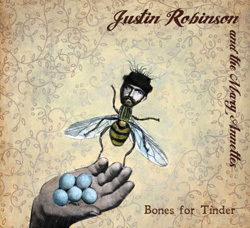 Liner notes: The leadoff track weaves together tender violin and Robinson’s melancholy voice in an ode to missing loved ones. Behind the music: The North Carolina native is an alumnus of The Carolina Chocolate Drops, the Grammy-winning combo known for reviving the style of Depression-era black string bands. Since starting his own band, the multitasking Robinson has also attended forestry school and created his own line of frozen custard. Check it out if you like: Traditionalists with one eye on the future, including Cassandra Wilson, Steve Earle, and Trombone Shorty.